Classes are held on Tuesday mornings. 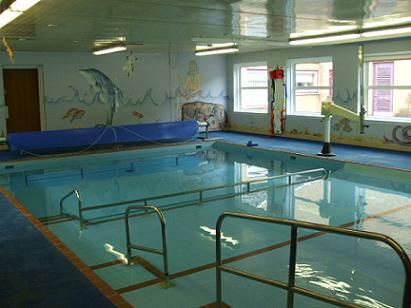 The hydrotherapy pool is kept to a minimum of 34 degrees ~ this is great for little babies & aids everyone in relaxing. It has 3 levels of depth; starting very shallow to allow the older children to enter independently. There is a no mobile phone / camera policy on the whole school site. Cars can be parked on the road leading to the school or on the large roundabout that is directly in front of the 2 schools on the site.